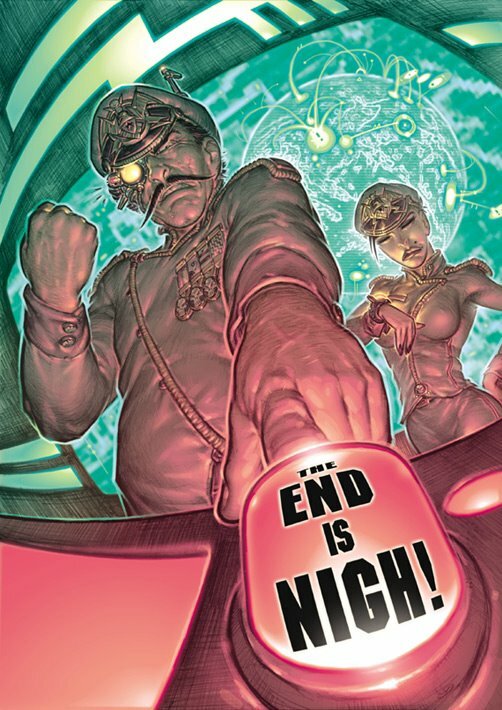 Press Release: THE END IS NIGH - get it ... before it's too late! Announcing the second fantastic issue of THE END IS NIGH, the official magazine of the apocalypse! Launching at the Comics Expo in Brighton on November 19 and 20, this issue it's war as we examine the whys and wherefores of how mankind's favourite pasttime could spell its demise! The issue features an EXCLUSIVE interview with comic writing god ALAN MOORE! Discussing the apocalyptic themes through most of his work, the writer turns dark prophet as he reveals why DR and Quinch's nuclear fetish was a bad idea, why George Bush is a bad idea, and even makes his own end-of-the-world prediction! Don't miss the fantastic full-colour cover by 2000AD favourite BOO COOK and artwork by 2000AD legend FRAZER IRVING! And there's also an interview with JOHN WAGNER and ALAN GRANT about The Last American, and artist MELINDA GEBBIE talks about her work on the film of When the Wind Blows. Plus there are the usual comic strips, news articles, in-depth features and funnies. At a special convention price of £3.99 (normal price £4.99), you can't afford to miss it! The website at www.endisnigh.co.uk will soon be updated with sneak previews of this issue's fantastic content! Check out our ads in the forthcoming issue of Comics International!